The Rev. 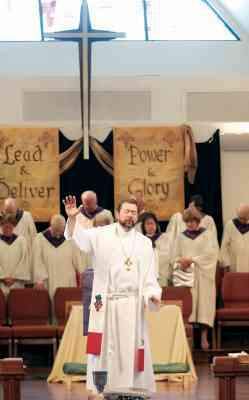 Jeff Huber says a benediction over the congregation at the First United Methodist Church of Durango on Sunday after delivering his first sermon in a Lenten series about the Lord’s Prayer. The banners behind him were made by artist and church member Susan Tait using materials from the Methodist Thrift Shop. In the earliest days of Christianity, converts were asked to learn three things during Lent - the Ten Commandments, the Apostles' Creed and the Lord's Prayer - to prepare for their baptism on Easter Sunday. During Lent this year, the Rev. Jeff Huber at the First United Methodist Church of Durango is presenting a sermon series on one of those original core parts of the faith, the Lord's Prayer. "There have been times I've been finishing the prayer," he said, "and I don't remember having said it at all. I had a lot of questions about the Lord's Prayer, and I've found that the best sermons come when I'm preaching about something I want to learn about myself." After his first sermon Sunday, Huber found that members of his congregation were excited about gaining a deeper understanding of this cornerstone of Jesus' teachings. He received 30 or 40 e-mails from people asking questions and had to remind them that he is just getting started on the prayer, which he is addressing on a line-by-line basis. The first lesson began with the first phrase, "Our Father, who art in heaven, hallowed be thy name," starting right away with the first two words. "One of the things we miss," he said, "is that it's 'Our' Father, not 'My' Father. This is not an 'I' faith, but a 'we' faith. We're all siblings in Christ." When people have a conflict with other Christians or question how they're living their faith, Huber said, just remembering the "our" will change the relationship. The Jewish word "abba," was the original term Jesus used for "Father," but in common usage, it is more like "Daddy" or "Papa" than the more formal "Father," he said. God wasn't to be seen as a being who is out there but one who is here with us. Then the prayer goes right from the familiar use of father to a worshipful sense with the word "hallowed." "Intimate closeness on one side," Huber said, "to holiness, reverence and awe coming together in the very first phrase." The prayer was considered radical and controversial when it was first taught. One of the reasons was that asking for God's kingdom on Earth seemed to encourage revolt against the Romans, who ruled Israel during Christ's life. Jesus taught the prayer during the Sermon on the Mount, in a block of teaching that also included the Beatitudes. Both the apostles Mark and Luke wrote about it, and a number of versions are used today in various denominations and different translations of the Bible. "We're doing it in an antiphonal singing version right now," Huber said. "It draws it out so it's a bit more reflective than when spoken, so we continually remember how important it is." During the series, Methodists also will hear versions said in other languages spoken by congregation members and a variety of forms. Some have said they want to pray it a bit more slowly. Huber intends to continue to find fresh ways to make it relevant. "It's one of the core beliefs of the Christian faith," Huber said. "It's the one thing that tells us who we are and whose we are."